LCP SYSTEM - LET'S EARN MONEY TOGETHER ONLINE !! Please follow the steps exactly in order to ensure a smooth setup. By now a member is supposed to have joined Adit Network at www.aditnetwork.com and have registered using the SPONSOR ID of the person who introduced him/her to the opportunity. This sponsor would be a member of TEAM UNITY and would have informed you of this website and asked you to get yourself a LCP system so you could start promoting. For original Team Unity members, you would have been introduced directly by the team leader and would already be signed up to Adit. You must now request a LCP system by sending an email to teamunityte@gmail.com with the heading "REQUEST FOR LCP"
-The Sponsor ID# of your sponsor. -The email that you would like to use for all of your Adit Network correspondence. IMPORTANT: If ALL of the above info is not provided, you will not receive the information to set up your LCP SYSTEM. Once you have been approved as being in the downline, you will receive and email from no-reply@topearnersclub.net inviting you to create your LCP SYSTEM. 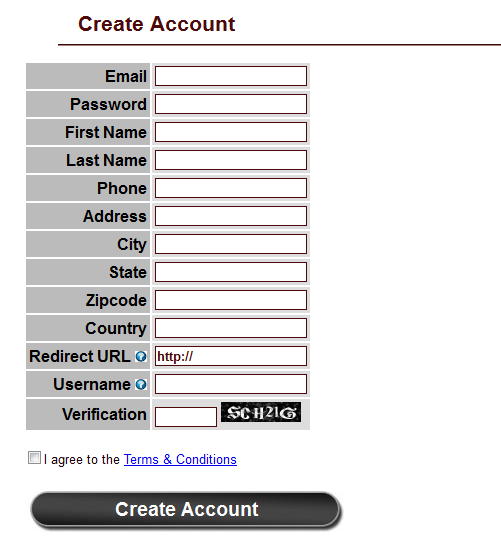 Please see below for what this form looks like and you are to fill out this form completely. Once you submit this form, please check your Inbox as it will contain an email topearnersclub.net. -- Pride you with login details to get in ( username + password). There you will see all of your personal info that you added from when you registered BUT you need to add in one important piece of information. 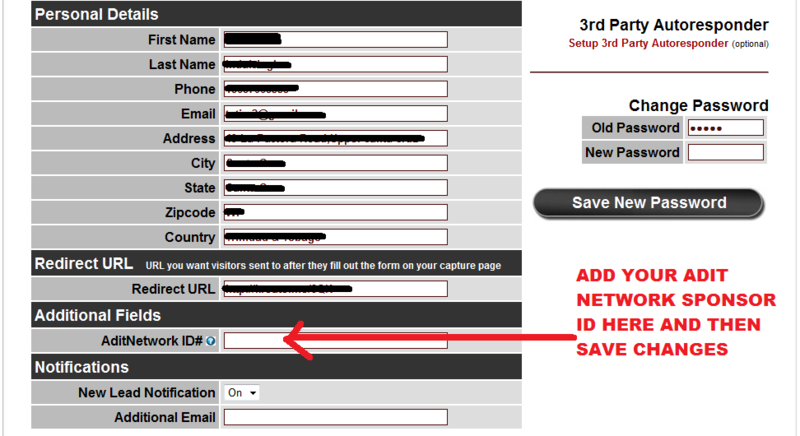 You need to fill out the box for your ADIT NETWORK SPONSOR ID and then save the changes to your personal info. The Auto Responder letters are coded so that you don't need to do anything and every lead will get information with your name, email and sponsor id automatically but you need to set this sponsor id so the system will know what to use. Please see the two screen shots below that will show you what/where to click and add info. Once you have completed the above, you now need to send in your LCP URL for a tracker link to be attached to it so that you would be credited for your marketing efforts and ensure that you continue to benefit from all that this system and this team has to offer you. To do this you need to send a new email to teamunityte@gmail.com with the heading "PLEASE PROVIDE TRACKER LINK"
Below you will see a diagram explaining the different features. A little lower in your back office you will see things like Banners and campaigns etc. Leave the everything as is for now as everything is set up for you already. You will see two banners there, a 468x60 and a 125x125 whih are our original and unique banners just for our use with Adit Network. Those who want to use banners to advertise as well can simply link these banners to their tracker LCP url link. The more advertising you do the better for us all so please try to advertise as much as you can. ****IMPORTANT***** CLICK HERE TO LEARN MORE ABOUT YOUR LCP SYSTEM....There is something that you need to do in order to load all of your Auto Responder emails otherwise your leads will not receive what they should. 5 Traffic Exchanges and 5 Safelists have been selected as part of our traffic generation exercise as a team. The idea is what if we are going to advertise anyway using these methods of advertising, we might as well try to maximize the benefit from our advertising efforts. With this in mind, "team links" have been set up for these 10 sites and members are asked to join these programs so that their efforts in advertisng in these programs create "bonus credits" to the team accounts. Sure some of you might already have signed up and are using some of these sites and if you are firmly entrenched in these traffic sites already then so be it, but for most of the people who are not really commited to any of these sites or anyone in particular, it would be a big help and advantage to simply create a new account in each of these traffic sites. It only takes a new username and email and a few minutes to get this done. More importantly, if you want to benefit from the BONUSES being offered then it's advised that you comply. Please go to the Traffic Downline Builder now and sign up. There is no substitute for hard work and commitment. In order to be successful with this ( or any other online opportunity ) you need to make the effort and put in the time. We have a great program in Adit Network and I am confident that once you put in the time and commitment, you WILL reap the just rewards. TRY IT...YOU MIGHT SURPRISE YOURSELF WITH THE SUCCESS YOU ACHIEVE!!! Many of you might still need to spend the time to really understand and appreciate the Adit Network opportunity completely. A lot of information has been provided for you to peruse already but if some are still not that clear on what's going on, please CLICK HERE as this page attempts to make you understand the Adit Network a bit better.